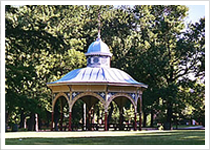 "My grown children were all going out of town and because I was anxious and uptight about them being gone, I thought it would be a good time to try Tower Grove Manor for the weekend. As soon as we closed the door on our apartment my husband and I both said in unison "This is it." We are not here on a trial basis, we are here, we are home! We loved the large rooms, the great closet space and the windows over looking Tower Grove Park. The walls are solid, you don't ever hear your neighbors. There is privacy if one wants or if you desire the fellowship you have it too. You can choose to go to the West Lounge to visit friends and or one of the other gathering places. What can I say about the staff? I love them. They are precious, caring and upbeat. The beauty salon services both women and men. The beautician is so special and talented she makes every one look fabulous. We have church on Sundays, Bible Study, music, art classes, and lectures. We can have dogs or cats if we desire. I love it here. 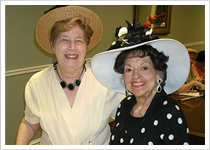 Every one who has come to visit me agrees, Tower Grove Manor is the place to be." "For me, there is one word that describes Tower Grove Manor - Home! When I walked in the first times I visited with my daughter we both felt the atmosphere was welcoming. When we left, I said to my daughter, "I think I'm home." Everyone, residents and staff are so friendly and helpful. The activities are varied and entertaining. The food is wonderful and since I no longer drive, the trips to the stores are very helpful. I have good friends here - it's HOME!" 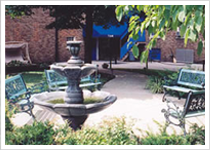 "Living at Tower Grove Manor gives me independence. I wouldn't want to live anywhere else." 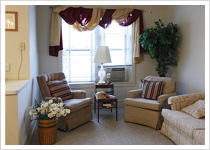 "At Tower Grove Manor, I enjoy all of the comforts at home, without any of the responsibilities of owning a house." "I moved to Tower Grove Manor eleven years ago, and my only regret is that I didn't do it sooner. It's a wonderful place to live."